If anyone knows me, they know that when I’m in the kitchen, sometimes I just make stuff up. Take tonight for example. 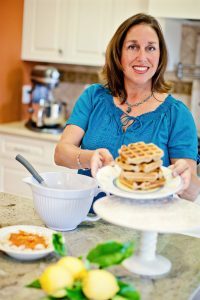 I am currently following the 21 Day Sugar Detox* (21DSD) from Diane Sanfilippo. She has a recipe in the 21DSD cookbook* for a veggie lasagne. 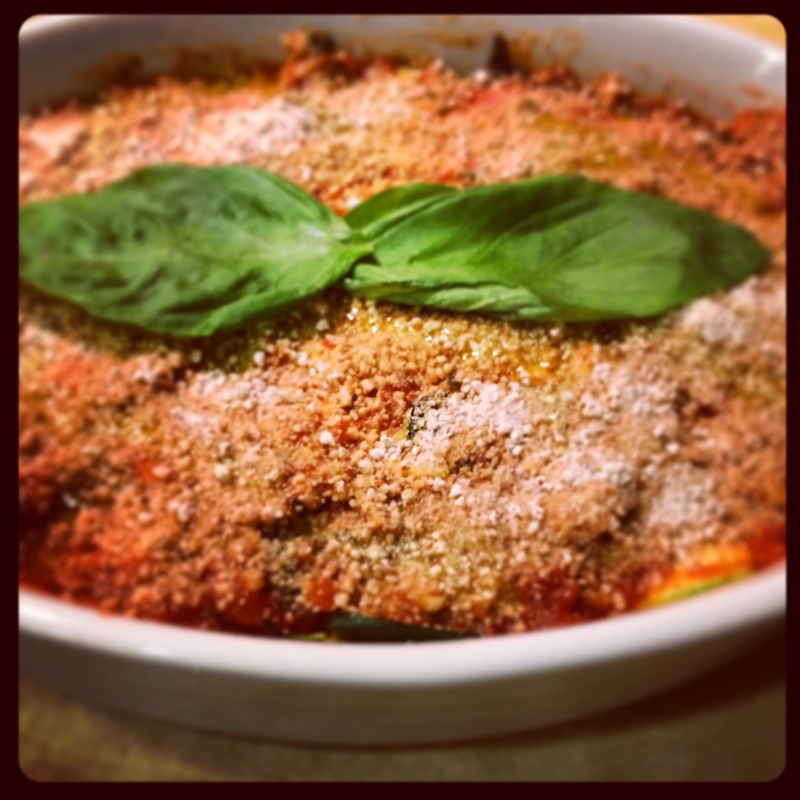 I would say that was my inspiration for this paleo lasagna but I took it a few steps further. For one, I added a macadamia nut ricotta as well as meat to the tomato sauce. I also topped it with almond meal. Let’s just say I was pretty much in heaven with my meal. I really can’t believe this is how I’m eating. I do not (and I’m being very honest) miss the pasta. *Note: these are affiliate links. Clicking on them will take you to amazon.com. If you purchase that item, I will receive a small percentage from amazon. This does not affect your price or cost. Thanks. The 21 DSD (that’s a regular, old link) basically eliminates all carbs including gluten, dairy, and sugar. This recipe uses none of these. It’s what I call “paleo plus” or super strict. This recipe also happens to be naturally gluten-free and dairy-free. Not nut-free though as the “ricotta” is made from macadamia nuts. Now if you don’t eat meat, omit it. Don’t like mushrooms? 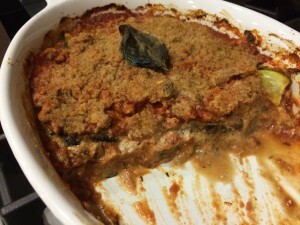 Use more eggplant or zucchini. Can’t have nuts? Skip it. Here’s how I did it. I used a 10″ oblong baking dish. This would probably work in an 8″ x 8″ pan as well. This dish probably serves about 3-4 people. There are a million recipes for sauce. I tend to make a simple version that’s quick, easy and delicious. 1. In a large saute pan heated to medium, brown ground meat with spices, salt, and pepper. Add garlic and stir. Cook for 1 minute. 2. Add tomatoes and water. If you are using a pre-made sauce, use it instead of the tomatoes and water. Simmer 10-15 minutes. 1. Prepare a baking sheet with parchment paper. Set aside. Preheat oven to 400F. 2. Slice eggplant into 1/2″ pieces (circles, not the long way). Place on a paper towel with salt under and on top. Place another paper towel on top. 3. Slice zucchini into long, thin slices. Place on top of the eggplant with salt. Top with another paper towel. Place the baking tray on top of it to help absorb the moisture from the eggplant and zucchini. 4. After about 10 minutes, place the eggplant and zucchini on the baking tray, removing the paper towels. Blot excess moisture. Drizzle with a few teaspoons of olive oil. Bake 10-15 minutes or until both are softened but not overcooked. Remove from oven and leave on the tray to cool slightly as you prepare the rest of the dish. 1. Heave saute pan to medium. Add olive oil, wait about 3 seconds then add mushrooms. 2. Cook until mushrooms are brown and softened. The less you move them in the pan, the better. I like the almond meal leftover from making almond milk. You can watch my video here on how to make it. Learn how to make your almond meal (flour) here. For this recipe, use a few tablespoons of almond meal and drizzle a teaspoon or so of olive oil on top. Assembly: Once you are ready to make the lasagna, preheat the oven to 350F. Place enough sauce on the bottom to cover. Add the eggplant, then the mushrooms. Top with the “ricotta” and a tablespoon of sauce. Spread evenly. Top with zucchini then more sauce to cover. Top with almond meal and drizzle with olive oil. Cover with foil. Bake 20-30 minutes or until bubbling. If you’d like, broil for a few minutes to make the top brown. Let rest 10 minutes then serve. Gayle, thank you for buying the book! Look at some of the other recipes I posted recently, specifically the one for paleo banana bread. That’ discusses how to do conversions. When you say they can’t have sugar, do you mean refined sugar or anything that converts to sugar like rice or other carbs? You can use honey, maple syrup or coconut sugar. I’ll try to help. And I do understand as I had to adjust our eating and cooking. Good luck!